‘Pathways’ in relation to adaptation is an approach designed to schedule adaptation decision-making: it identifies the decisions that need to be taken now and those that may be taken in future. The approach supports strategic, flexible and structured decision-making. The pathways approach allows decision makers to plan for, prioritise and stagger investment in adaptation options. Trigger points and thresholds help them identify when to revisit decisions or actions. Examples of pathways approaches can be translated into visual aids such as ‘route maps’ that support communication and consultation with stakeholders. The adaptation pathway approach has been successfully applied in adaptation planning for infrastructure and water management projects, and broader cross-sector adaptation planning. A pathways approach to adaptation planning is about keeping options open and so avoiding path dependency and lock-in (as explained in the Overview of adaptation). It provides structure and guidance to help incorporate flexibility into adaptation planning. It can reduce unnecessary expenditure, preventing organisations from being locked into actions that may not be the best solutions for what is a long-term problem. Under the approach, rather than determining a final outcome or decision at an early stage, decision makers are able to build a strategy that will follow changing circumstances over time. The approach acknowledges that while not all decisions can be made now, they can be planned, prioritised and prepared for. It is a useful approach for dealing with uncertainty, especially in cases where the uncertainty may reduce over time, for example with improvements in estimates of future local sea-level rise. What is a ‘pathways approach’ and how can it be used in adaptation planning? Each decision-point is triggered by some change (environmental or social). In the design of the strategy, the steps and the triggers must be identified (see Box 1 for definitions). Each decision-point has a series of identified choices or options associated with it. Once the decision-point is triggered, the options for that step are ‘tested’ against plausible futures and the acceptable risk to the organisation or community, and a selection is made. 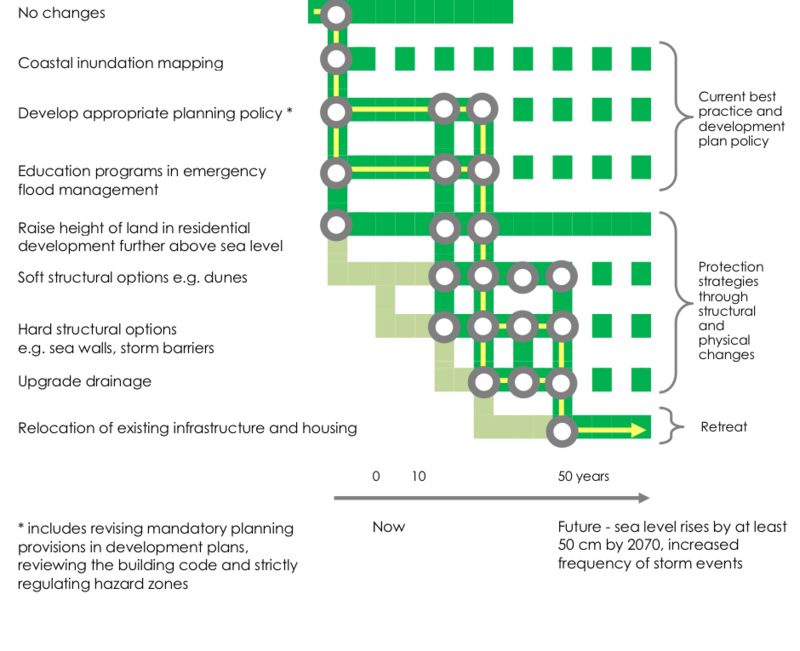 The selection leads to the next section of the pathway, and in turn to the next decision-point. The options that are not selected will, if appropriate, be available for selection at the next decision-point. The wide range of options considered, evaluated and left on the table for the future gives decision makers flexibility and allows decisions to be responsive and iterative. Box 1: What are thresholds, lead times and decision points? A threshold of the system being managed. An example is the ability of a plant or animal species to survive in its current range. This type of threshold is commonly referred to as a tipping point. A threshold related to adaptation options under consideration. For example, the construction of a new seawall might be an adaptation option under consideration. The threshold is the point at which the existing seawall is overtopped by rising seas. In setting thresholds of the second type, it is necessary to consider the lead times associated with adopting a new approach. In the case of major infrastructure there will be time for design and construction, time to obtain the necessary finances, and also time to negotiate with communities to ensure their preparedness and acceptance. Understanding the thresholds and lead times for adaptation options will help identify decision points. Thus, community acceptance of flooding may reach a threshold once flooding frequency exceeds, say, five times per year on average. However, it may be necessary to set the decision point prior to that threshold to ensure that there is sufficient lead-time to implement the next adaptation option. about the range of adaptation options that will be available in future, their associated costs, social acceptability and feasibility. Uncertainty makes it unlikely that successful adaptation solutions will be one-off and static. They will need to be flexible and responsive to changing circumstance. The concept of ‘adaptation pathways’ has emerged to address these challenges. A pathways approach should guide decisions away from maladaptation and reduce exposure to risks that are considered unacceptable to the community. 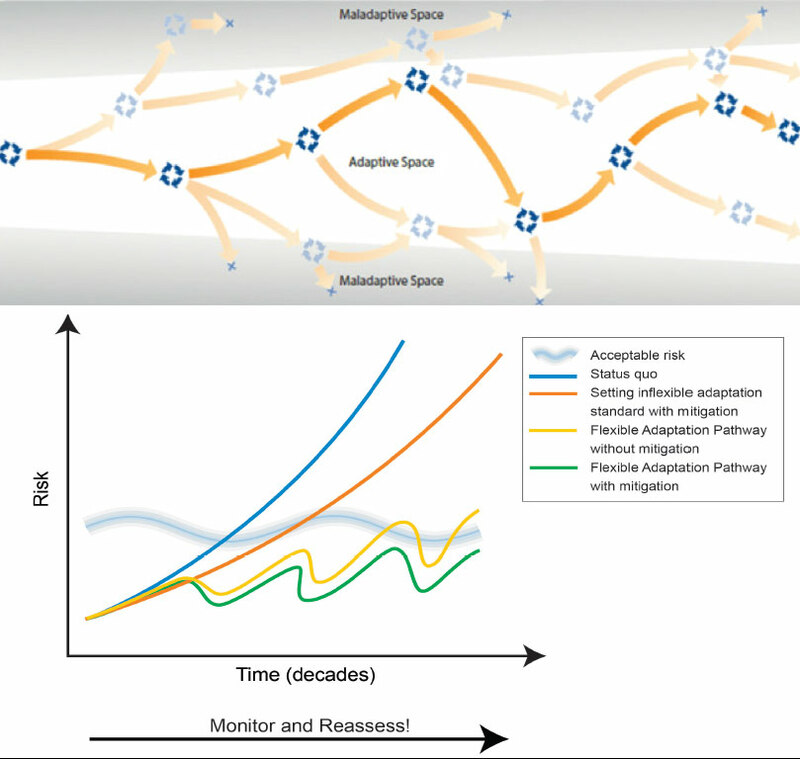 Figure 1: Models of the adaptation pathways approach showing (above) that the selection of pathway is intended to keep adaptation decisions from becoming maladaptive and (below) that a flexible adaptation pathways approach (particularly if coupled with mitigation) should help ensure that unacceptable risk is avoided. Sources: Reisinger in Wise et. al 2014 (above) and Rosenzweig and Solecki 2014, adapted from City of London, "The Thames Estuary 2100 Plan," April 2009 (below). The adaptation pathway approach has been successfully applied in adaptation planning for infrastructure projects, e.g. the Thames Barrier as described in Box 2, water management projects (Haasnoot et al. 2013) and broader cross-sector adaptation planning, e.g. in the Eyre Peninsula (South Australia) as described in Box 3. An example developed to engage the community in decision-making around coastal management is shown in Figure 2 (Barnett et al. 2014). Figure 2: An example of a simple local adaptation pathway, developed for Lakes Entrance, Victoria, showing the sequence of triggers, (tipping points or thresholds), areas likely to be affected and the policy steps they activate. Source: Barnett et al. 2014. The decision pathway and its adaptation options can be illustrated in the form of a ‘route map’ or similar diagram. Examples of these route maps are shown and discussed in Box 2 and Box 3. Not all adaptation planning can be neatly captured in a route map, but the principles of a pathways approach remain useful. London’s flood defences centre around the Thames Barrier (Figure B1), which can be raised to defend the city from flood during storm surge events. 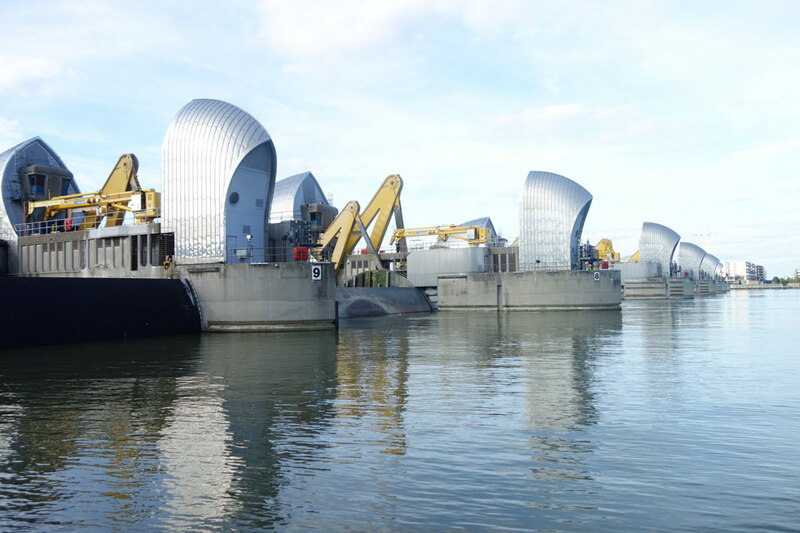 The Thames Barrier took 30 years from the decision to build through to operation, and so the time has come to plan for future flood defence under climate change. Planners took an innovative approach, driven by the anticipated very large cost of the project and the uncertainties involved. They laid out a decision pathway up to the year 2100 which considers a number of future climate and sea-level rise scenarios and alternative adaptation options (Figure B2). The pathway identifies the future points at which investment becomes necessary in the light of evolving climate change and sea-level rise which ensures that any new scientific and technological understanding can be incorporated to the extent that is possible (Reeder and Ranger 2011). A key characteristic of the pathway is that the triggers for the decision points are scaled against sea-level rise, not time. Therefore the pathway is independent of time, removing one source of uncertainty (the timing of sea-level rise). The pathway allows for short-term measures, such as raising existing defences, as long as these do not close off the option of a new barrage. Design and construction of the new barrage will not begin now, but will be triggered in the future when sea level reaches a specified threshold, and when it is clear that more cost effective options have been exhausted. Figure B1: The Thames Barrier. Photo: © Chris Wheal. Figure B2: Planning for London’s future flood defences. Source: Modified from HM Treasury and DEFRA 2009, and Reeder and Ranger 2011. Four scenarios of maximum water-level rise were considered, from the most likely (0.9 m) to the worst-case (4.2 m). Four high-level response options (to deal with extreme water-level rise) were identified: improving existing defences, maximising storage, constructing a new barrier, and a new barrier plus locks/barrage. Each option will protect up to a certain sea-level rise. Once these options are laid out, a pathway can be mapped out that takes into account such factors as community acceptability, lead times and cost. A possible ‘route’ is shown as the red line in Figure B2, which begins with ‘low-regret’ actions and only moves to the high-level options once sea-level rise exceeds around 2 m (HM Treasury and DEFRA 2009; Reeder and Ranger 2011). The Eyre Peninsula is situated in South Australia between Spencer Gulf and the Great Australian Bight (Figure B3). The region supports a population of about 56 000 people with a diversified economy including agriculture, aquaculture, fishing, mining and tourism. Figure B3: Location of the Eyre Peninsula. Source: © NCCARF 2016. In 2014, a regional climate change adaptation plan was prepared by the Eyre Peninsula Climate Change Agreement Committee (EPICCA), a partnership of natural resource management, regional development and local government groups, together with the South Australian Government). They engaged a consultant, Mark Siebentritt, to help them work through the process. The team set out to identify options and pathways for key industries on the Eyre Peninsula to adapt to climate change. The plan features visualisations of adaptation pathways for eight sectors or challenges of the region and an overarching regional pathways route map, see http://www.naturalresources.sa.gov.au/eyrepeninsula/projects-and-partners/climate-change (accessed 8 April 2016). Figure B4 shows an example pathway for agriculture. Figure B4: An example adaptation pathway from the Eyre Peninsula, for agriculture. Source: Siebentritt et al. 2014. In developing their process, the Eyre Peninsula project team looked at past examples of adaptation pathways. They found that, although the process ‘made sense’, these examples were highly technical and very expensive to develop; they were looking for a low budget and participatory approach. This guided the steps they took. The team undertook an extensive program of engagement that included initial interviews with stakeholders and ongoing structured conversations. Adaptation pathways were developed and then further discussed and refined at workshops with key regional leaders and influencers. Referring back to initial interviews helped the project team to ensure that workshops were used to review, and where possible agree to, information rather than generate new information. The process identified a long ‘shopping list’ of options for the future, which helped the team to understand that not all options and decisions must be made straight away. The community found the pathways helped them appreciate that they are not faced with a need to spend large amounts of money immediately – there is the opportunity to sequence investment. This relieved many of the anxieties felt around adaptation. Further information on this study can be found in Eyre Peninsula: adaptation policy making. Why would you use the pathways approach? The pathways approach promotes adaptive management — it enables adaptation plans to be ongoing by incorporating flexibility and adaptability into the decision-making process. Not all decisions must be made immediately and options can remain on the table. This prevents decisions being made now that lock decision makers out of other options in the future. It buys time to plan and reduces the pressure of making decisions now. An ongoing process of monitoring and evaluation identifies the trigger points at which further decisions or actions will need to be undertaken. This should help remove the pressure of making all decisions now. It also creates time to build strategies for funding, gain community support and generate the necessary knowledge to implement future decisions. Importantly, it can help identify the first steps that can be taken. A key characteristic of the pathways approach is that the triggers for the decision points are scaled against events, not time. Events might be related to sea-level rise, flooding, or heat-waves— any climate-related occurrence that is expected to get worse as a result of climate change. Therefore, the pathway is independent of time, removing one source of uncertainty (the timing of the event). The flexibility of the pathways approach allows for plans to respond not only to changes in climate but also changes in the risk appetite of communities. For example, following Hurricane Sandy, the City of New York used the flexibility of their adaptation pathways approach to meet a reduced appetite for risk among its residents (Rosenzweig and Solecki 2014). Keeping options open enables managers to hold off making decisions that may be expensive, until better information is available about the impacts of climate change. It allows sequencing of adaptation options, starting from low controversy, soft options and only moving to higher impact more expensive options as certain thresholds are reached. A possible risk of using a pathways approach, which is common to all adaptation planning, is that it may lead to undesirable or maladaptive outcomes. While the process is intended to help avoid this, it is important to recognise that there is always a risk with making decisions under uncertainty. Using the pathways approach allows the opportunity to learn from the outcome of past decision-making, to incorporate that learning into future decision-making, and to build a better understanding of managing future risks. The pathways approach is a response to the growing awareness that adaptation demands dynamic, long term and transitional approaches that can accommodate uncertainty and avoid future maladaptation, and that on-ground practitioners need the tools to move beyond strategic planning and into taking action. Early examples of the application of a pathways approach involved considerable investment to model a large number of scenarios for engineering solutions (e.g. planning for the risk of flooding and sea-level rise in the Thames Estuary, London, UK, see Box 2). Many organisations contemplating adaptation in Australia are small with limited in-house capacity and technical expertise and a stronger reliance on community consensus. There are a number of case studies that incorporate the pathways approach into adaptation plans that are more focused on community participation and consensus (Barnett et al. 2014; SGS Economics and Planning 2012; Siebentritt et al. 2014). This emphasis on a low-cost, participatory approach is described in Eyre Peninsula: adaptation policy making. How would you undertake a pathways approach? How are individual decisions connected (does one decision depend on another being taken)? The timing of adaptation options: How long will an adaptation option be effective in reducing climate risks? What is the lead-time needed to implement an action? What resources are available now and potentially in the future? Some options may need to be considered that are a significant departure from customary practice or that require significantly different cultural, political or governance mindsets. These options are generally referred to as transformative adaptation. They will often require new governance or social structures to be established in preparation for the transformation. Defining and scoping the areas of decision-making including determining the objectives or a vision of what success might look like. The results of this scoping exercise can be used to identify stakeholders and elicit their values. Determining thresholds and trigger points – see Box 1 for definitions. Achieving this step is likely to involve stakeholder consultation and/or interrogation of future climate change scenarios and projections. Backcasting, i.e. working back from the desired outcome to the present day to understand what steps are required to arrive at the desired outcome. Developing decision pathways and decision points and beginning the journey along the chosen pathway. 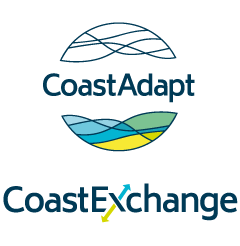 The pathways approach can be simply incorporated into the CoastAdapt decision support tool C-CADS. The C-CADS process outlines how this can be done. 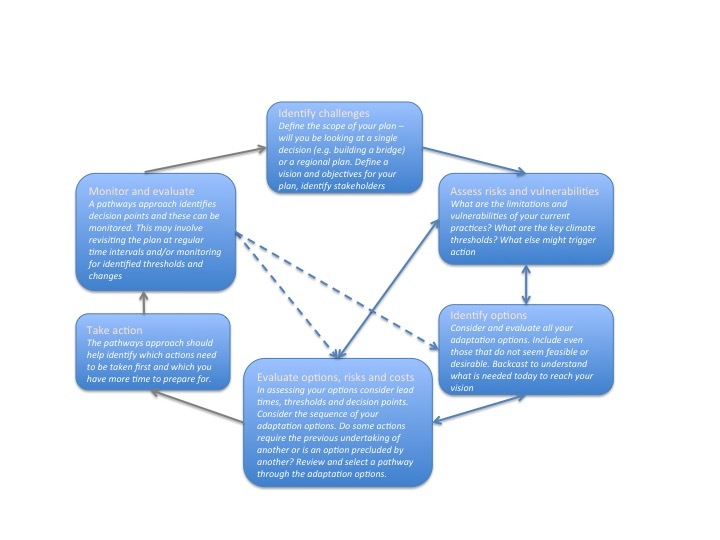 Figure 3 summarises the key elements of a pathways approach at each of the steps of the C-CADS risk assessment and management framework. See Section 8 of Information Manual 4: Costs and Benefits for more details on the pathways approach to adaptation. Figure 3: Incorporating the adaptation pathways approach into C-CADS. Source: © NCCARF 2016. Barnett, J., S. Graham, C. Mortreux, R. Fincher, E. Waters, and A. Hurlimann, 2014: A local coastal adaptation pathway. Nature Climate Change, 4, 1103-1108. Haasnoot, M., J.H.Kwakkel, W.E. Walker, and J. ter Maat, 2013: Dynamic adaptive policy pathways: a method for crafting robust decisions for a deeply uncertain world. Global Environment Change, 23(2), 485-498. HM Treasury and Department for Environment, Food and Rural Affairs (DEFRA), 2009: Accounting for the Effects of Climate Change. Supplementary Green Book Guidance. Retrieved from UK. Accessed 8 April 2016. [Available online at https://www.gov.uk/government/uploads/system/uploads/attachment_data/file/191501/Accounting_for_the_effects_of_climate_change.pdf]. Reeder, T. and N. Ranger, 2011: How do you adapt in an uncertain world? Lessons from the Thames Estuary. World Resources Report Uncertainty Series, World Resources Institute, Washington DC, USA. Accessed 8 April 2016. [Available online at http://www.wri.org/sites/default/files/uploads/wrr_reeder_and_ranger_uncertainty.pdf]. Rosenzweig, C. and W.D. Solecki, 2014: Hurricane Sandy and adaptation pathways in New York: Lessons from a first-responder city. Global Environmental Change, 28, 395-408. SGS Economics and Planning, 2012: Tasmanian Coastal Adaptation Pathways Project: Lauderdale Recommended Actions. Tasmanian Coastal Adaptation Pathways Project and Clarence City Council. Accessed 8 April 2016. [Available online at http://www.ccc.tas.gov.au/webdata/resources/files/01-Harkin J - TCAP Lauderdale Adaptation Pathway Recommendations 120712, Final - 13July2012.pdf]. Siebentritt, M., N. Halsey, and M. Stafford Smith, 2014: Regional Climate Change Adaptation Plan for the Eyre Peninsula. Eyre Peninsula Integrated Climate Change Agreement Committee, South Australia. Accessed 8 April 2016. [Available online at http://www.naturalresources.sa.gov.au/eyrepeninsula/projects-and-partners/climate-change]. Wise, R.M., I. Fazey, M. Stafford Smith, S.E. Park, H.C. Eakin, E.R.M. Archer Van Garderen, and B. Campbell, 2014: Reconceptualising adaptation to climate change as part of pathways of change and response. Global Environment Change, 28, 325-336.